In the age of the smartphone, distracted driving is a serious and growing problem that causes thousands of accidents every year. For motorcyclists, distracted driving can be particularly dangerous. A driver who is not paying attention to the road will have a harder time identifying a motorcycle given their smaller size and lower profile. Given that motorcycle riders are already at a higher risk of injury in the event of an accident (due to the exposure they face and the limited safety features of their vehicle) and you can see how a distracted driving accident is especially dangerous when a motorcycle is involved. If you were in an accident when riding your motorcycle and belief that the driver of the other vehicle was distracted, you might be able to prove driver negligence which would help you to recover compensation for your injuries. The attorneys at Slappey & Sadd are experienced motorcycle accident attorneys who have a long history of competently representing our clients’ interests. We will take a close look at your case, review the details and work to recover the maximum compensation you are entitled to. We serve the entire state of Georgia, including Gwinnett County, Muscogee County, and Newton County. Distracted driving is defined as engaging in any activity that takes your attention away from the task of driving. This can include manual distractions (such as eating and drinking, adjusting audio controls, and smoking), visual distractions (such as applying makeup, looking at a map, or taking in the view), and cognitive distractions (such as talking to other passengers, daydreaming, or being under the influence of drugs or alcohol). Texting while driving is another major source of distraction that involves all three distraction classifications outlined above. Also note that texting while driving in Georgia is illegal and may be used as evidence of negligence if the texting driver causes an accident. Distracted driving presents a greater danger to motorcyclists than to drivers of ordinary automobiles. Most accidents involving motorcycles and passenger vehicles are caused by drivers who do not notice the motorcycle on the road. Because distracted driving is a factor in a very large proportion of all traffic accidents, distracted driving negatively affects motorcyclists as much as it does other motorists. However, other motorists are afforded greater protection by the steel shell that encases them, while motorcyclists are much more exposed and vulnerable. Motorcycles are also much smaller than regular vehicles, which make them harder to see, even for drivers who are not distracted. Their small size, which makes it less likely that a driver putting on makeup or texting will see them in the first place, leaves motorcyclists even more vulnerable to distracted driving. 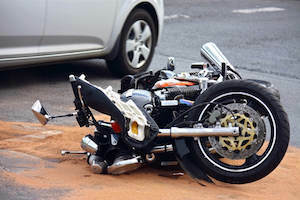 Because motorcycles are harder to see and have far fewer safety mechanisms than regular vehicles, they are likely to suffer more disastrous injuries in a distracted-driving accident.